The Neo Geo Pocket was sent spiraling into early obsoletion by its own parent company after less than a year on the market. Yet, by loading cartridges built for its successor, the Neo Geo Pocket Color, into the little monochrome device, it's possible to view all manner of interesting secret stuff...and even, with the right combination unlock a brand new game! The Neo Geo Pocket Color is, without a doubt, one of loveliest handhelds ever created. Boasting a fantastic, if limited, line-up of mostly original software, it remains an essential part of the discerning retro-gamer’s handheld collection. 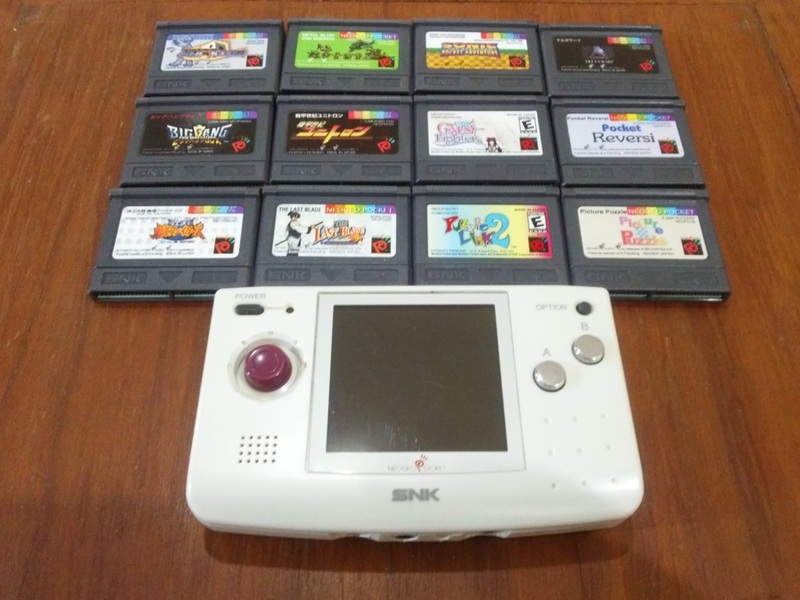 Its predecessor, the monochrome Neo Geo Pocket, is, by comparison, generally regarded as awful. While it boasts the same lovely clicky arcade stick as the NGPC, it is blighted by a hugely reflective, ridiculously hard to see screen (even after fiddling with the contrast dial) and suffers from the usual problems with ghosting and motion blurring. It’s no wonder then, that after barely a year and a paltry nine games released for the format, SNK’s first stab at a portable was discontinued to make way for its flashier, full colour brother without even getting a sniff of the Western release afforded to its successor. As a way of making it up to those Japanese gamers who shelled out for the monochrome version, the vast majority of the Neo Geo Pocket Color’s 85 full colour games remain backwardly compatible with the original monochrome unit. While most run in monochrome, no real effort has been put into adjusting the palette selection, meaning that stuff like Sacnoth’s Dive Alert series or the NGPC iteration of witch-based shooter Cotton, display as an infuriating mess of dark black splodges when played on the original unit. It’s probably for this reason that many later releases ceased to be backwardly compatible. Above: Our original Neo Geo Pocket system and a selection on non-backwardly compatible games, several of which reveal some nice little easter eggs when you try to run them and one of which drops a real hidden pipebomb by booting up an entirely new game! So is there any point in owning a Neo Geo Pocket if you already have the superior Color model? Well, that’s where things get interesting. While some developers chose to simply display a standard “not compatible with this device” message on booting up their color game on a monochrome NGP, others tried to be a tad more creative. In this article, we shall take a look at the games that were locked off to monochrome gamers and discover the secret screens, artwork and animations that crafty coders chose to reward monochrome gamers with, culminating in the discovery of an entire SECRET GAME that can only be played by plugging a particular NGPC cartridge into a NGP unit. Yes, it turns out that you can’t play the full library of Neo Geo Pocket games with just a NGPC unit after-all. If you want to play the hidden 95th game then you’ll need to start picking up both a certain Japanese exclusive software title for the NGPC and a monochrome NGP unit to play it on! Follow the links below, as we boldly spend a Saturday afternoon switching a defunct handheld on and off again and doing a poor job of photographing the resulting secret stuff we discover in the process.